Colorful, flexible, lightweight logging for Swift 3, Swift 4 & Swift 5. Great for development & release with support for Console, File & cloud platforms. 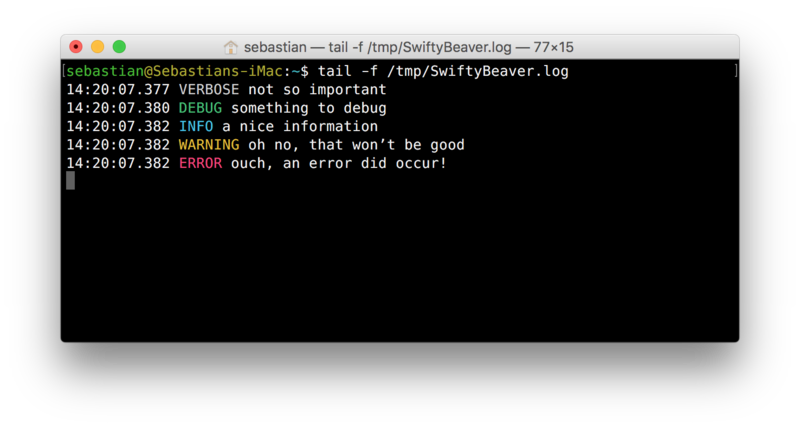 Log during release to the conveniently built-in SwiftyBeaver Platform, the dedicated Mac App & Elasticsearch! Conveniently access your logs during development & release with our free Mac App. 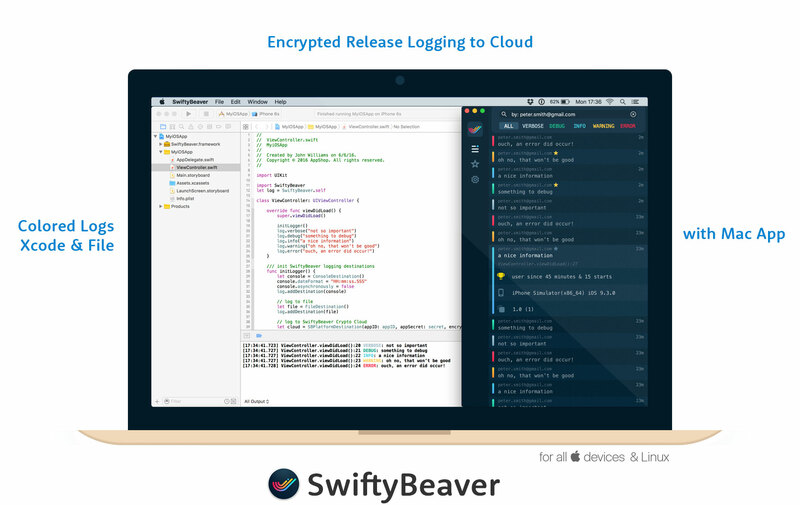 Learn more about legally compliant, end-to-end encrypted logging to Elasticsearch with SwiftyBeaver Enterprise. Install via Docker or manual, fully-featured free trial included! You can fully customize your log format, turn it into JSON, or create your own destinations. For example our Google Cloud Destination is just another customized logging format which adds the powerful functionality of automatic server-side Swift logging when hosted on Google Cloud Platform. We plan to discontinue the support for CocoaPods due to its issues with latest Xcode and Swift versions latest at the end of 2018. Please use Carthage or SPM instead to stay on top of new SwiftyBeaver releases. Add that near the top of your AppDelegate.swift to be able to use SwiftyBeaver in your whole project. // add log destinations. at least one is needed! console.format = "$DHH:mm:ss$d $L $M"
// or use this for JSON output: console.format = "$J"
console.format = "$L: $M $X"
log.debug("age", 123)  // "DEBUG: age 123"
log.info("my data", context: [1, "a", 2]) // "INFO: my data [1, \"a\", 2]"
swift build --clean && docker build --rm -t swiftybeaver . More destination & system documentation is coming soon! Get support via Github Issues, email and public Slack channel. SwiftyBeaver Framework is released under the MIT License.